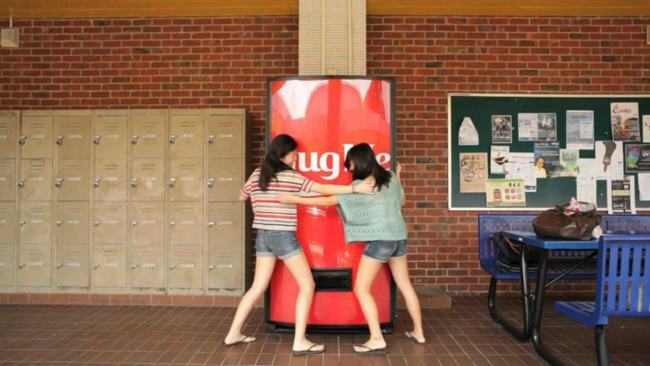 There is a “Hug Me” Coca-Cola machine in Singapore which gives you a can of coke each time you hug it. Coca Cola has cracked the best way to get eyeballs rolling in Singapore. They have created this vending machine which gives out Coca Cola cans in exchange for free hugs. This awesome idea is a part of the “open happiness” campaign of the company. It is mainly targeted towards the young people in a marketing stunt that features gestures which is currently being tested in Singapore. This machine which was placed in the National University caught the students by surprise. This vending machine has “Hug Me” written on the door instead of the logo of the brand. So the students have to squeeze both the ends of the machine in order to get this coke instead of paying for it. Even though public displays of affection are not at all encouraged in Singapore, they are on the rise amongst youngsters. The whole idea behind this marketing campaign is to present Coca Cola as a brand which is not threatening but rather welcoming. It also depicts the youth’s rise in public display of affection. The machines have become a success and there are plans to rolls them across Asia.